Last year I mentioned that I have a thing for the designs of Hollywood designer Helen Rose. That love affair began when I rented the 1957 movie, Designing Woman. The photos below are about six years old and aren’t very large. But, you can get a sense of her femine yet professional style. 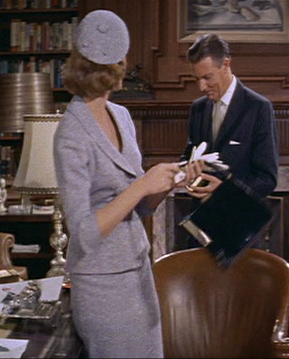 In the film Lauren Bacall plays a fashion designer who marries a sports writer. 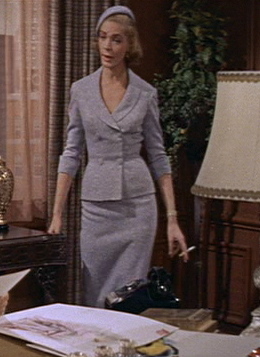 Note the definition of the waist and the slimline of the skirt. Don’t even get me started on the PERFECT angle of her cute little hat. Mmmm. The fabric covered buttons and the white gloves too! 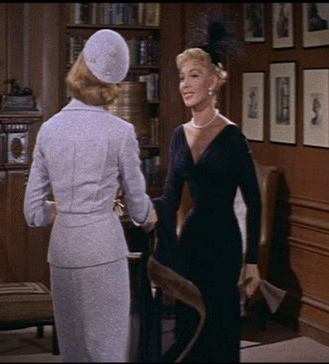 And the black hat on her imagined love rival is fantastic. Sigh. I love it. 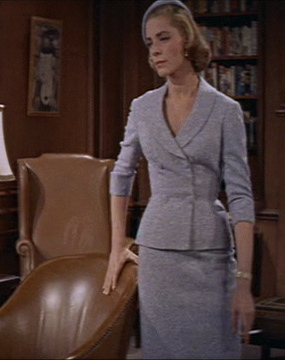 You know, if Mad Men is filled with images like this, I get why everyone raves about it. This isn’t even my favorite dress! I’ll show you another one soon. I love that style of jacket. Tailored, yet feminine. I’ve collected a bunch of the “retro” patterns. Who knows, I may even make one someday. It could happen. This is fast becoming my favourite era of (wearable) style. I have been buying up vintage patterns online like a mad thing for the last few months to self-medicate for not being able to properly use my machine again until about June (which will make it almost a year *shudder*). My plan, starting in June, is to transform my wardrobe en masse to an updated/modernised 1950s vibe/silhouette. Between buying and a big box of vintage patterns I was given I have about 40 patterns I’m dying to make up. Unrealistic, I know, but it’s a habit (just look at my blog, lol). Thanks so much for sharing this, Lauren Bacall is one of my favourite actresses. It will really be the final end of that era when she passes away. To think, the wife of Bogey is still living – and working! One of my favorite times too, and I make a lot of clothing from the era. I find it fascinating and sort of mystifying as to why women like you, young successful career women in the sorts of careers that women didn’t and couldn’t have back then find the 50’s so inspiring. The clothes were restrictive, have you ever worn a girdle or walked in those narrow skirts? They certainly weren’t for striding down the street. There’s a reason that the Feminine Mystique was written in ’63. Thanks for these photos! I have a Helen Rose pattern, published by Advance. It was for the movie “Nancy Goes To Rio”, made in 1949 or 1950. Her suits and hats are just divine. THERE WERE HELEN ROSE PATTERNS?!! How did I NOT know this?? Omigosh. Ok. Breathe. I am now on an ebay hunt. Nancy k, I think you’re missing a little bit of something here. 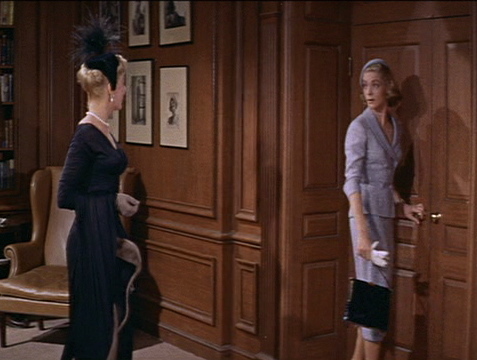 We don’t want to *live* in the 50s, it’s the style and silhouette that is appealing. You are correct that clothing then could be restrictive and uncomfortable – to our current sensibilities. However, when you grow up with something it’s not necessarily so much the case. When corsets were first abandoned in the early 20th century many women refused to give them up because they found life without them too uncomfortable. There are also more types of “comfort” than physical. The aesthetics of 1950s fashion are sophisticated and elegant, and actually flatter more real women’s bodies than a lot of today’s trends since they make the most of curves. I, personally, mostly deplore the 1960s cultural revolution in terms of it’s effect on people’s everyday appearance. I still believe (as outmoded as you may think it) that putting care into one’s appearance and wardrobe sends a message of respect of self. Additionally, we today don’t have to be uncomfortable in clothing styled on 1950s lines. Since lycra can be found added to practically all fibre types both knit and woven, and since it most certainly not required that women wear girdles under their clothes anymore, we can achieve much of the same stylish elan as our forbears while maintaining comfort not far off from jeans and t-shirts. Is it the current 3rd wave feminism that allows, and even encourages, women to embrace their femininity if they so desire? By maintaining that manifestations of femininity are inferior and should be shunned, masculinity and the male are still held up as the superior ideal. The skirt is tres cool, but $60 is just too much for me. I still can’t believe I recently spent $40 on a vintage 50s dress pattern – though I don’t regret it a bit! I too, love the 1950’s. 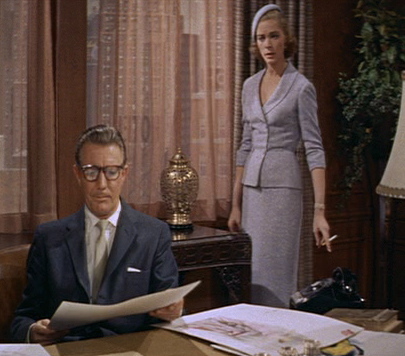 I love the clothes that Doris Day wore. Not to put Lauren Bacall down because what few movies I saw her in, I loved what she had on as well. It really is something to see about the fashion of that era. You can see that the women were polished and a lot of today’s fashion does not make you look polished. You really have to work at putting patterns and fabrics together to achieve that look. I am a conservative when it comes to clothing and I do venture out with some items, but I am not fond of a lot of the clothing out on the market today. I am already hard to fit because I am considered tall. And now that I have a little weight on these bones, I have to make a real effort to look nice in what I put on. Not to mention all that junk in my trunk which is just about to get on my nerves. I am glad to see that some of the retro/vintage styles are making their way back into the pattern world. For those of us who sew we could really make a statement then. See now NancyK, I’m in my 30’s and grew up with foundation garments have to be worn, and find the thought (and many statements) that a slip is passe (or an outer garment) rather kind of lame. And, yes I have worn a girdle, and a restrictive skirt (with heels) and rode a bus for transportation, walked several miles in them and kept up with the son’s Boy Scout troop/field trips. I don’t always look totally polished and put together, but I don’t have to live in jammie bottoms and sweats to accomplish an active lifestyle either. As an issue of feminism, my mother was encouraged in the 50’s by her blue collar father to do whatever she wanted to. My own redneck dad thinks I should be able to bake a cake, fix a car or make a man’s wage…and I can. I was raised that feminism was what *I* chose it to be as a woman, not what another woman told me it had to be.